Apparently, my attention span isn’t working well with more substantial projects. Maybe I need to take a break after the Aran Afghan. Here’s another “stash-buster” project that I whipped out over the weekend, just because I was in the mood to do something different and something quick. 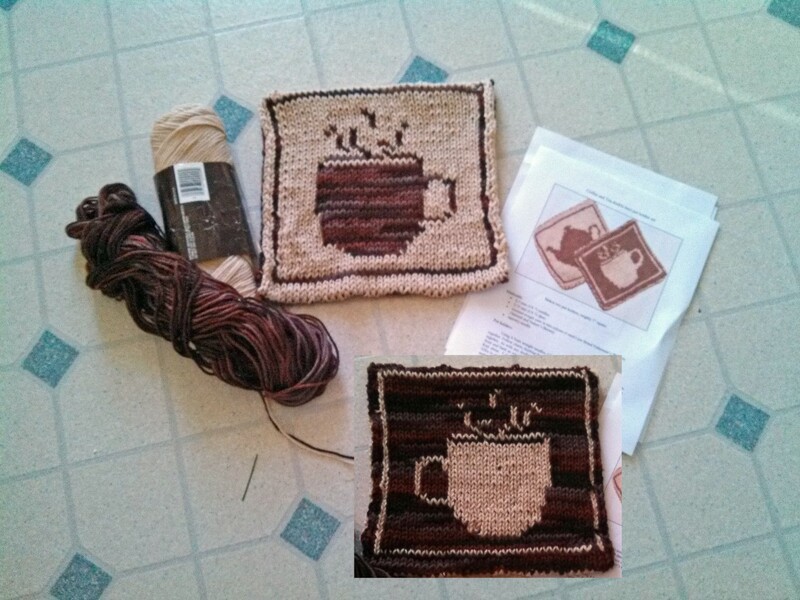 This is a double-knit Coffee Cup, one side of the Coffee and Tea DK Pot Holders from Elizabeth Evans, and available for free on Ravelry. Don’t look too closely – I can use more practice on my double-knitting skills, and I didn’t think my attention and patience was up for a two-sided project, so I did the coffee cup on both sides (reverse side is the inset photo) Yarn is mystery yarn from my stash, probably basic acrylic yarn inherited from my grandmother’s stash. Still, the project was fun, and I refreshed my memory on casting on, double-knitting, and invisible bind-off (which, as far as I can tell, is simply the Kitchener stitch, available at this and many other YouTube links). After I finished the project, I realized that I should have twisted the yarn at the wrong-side end; the other three sides are bound invisibly, but there are two “edges” to that side. Maybe I’ll do another quick project. This looks interesting: Star Trek Pot Holders. So does this: Leaf Pattern. Both free on Ravelry. Another square completed – 12 of 20. Since I’m not working through the patterns in the book in any sort of order, I have suddenly realized that I probably should make notes so I don’t work the same square twice. For those of you following at home, this is the Aran Afghan, from the Great American Afghan series. The books are getting a bit hard to track down, but some of the yarn vendors carry them. There are four in the series, including one for a children’s afghan. They’re of a quilt-block, sampler design, and are terrific skill-building project, since they give you a great exposure to different styles of knitting, from aran, to cables, to entrelac. Because each square is different, my attention tends to stay on task more than for other big projects. Win-Win. Yarn is Plymouth Encore (as recommended in the book) in color Taupe (I incorrectly identified it as Oatmeal in an earlier post). Latest completed is the lower right (which, of course, is furthest from the the camera). I didn’t think I would like to the squares that were knit “in the round,” but I find that they are actually easier, because you only have to keep track of one chart – worked four times (one for each side). Both the top right and bottom right squares were knit this way – starting from the outside (in the round) and knitting your way to the center; something like a sock cap (but without the obvious shaping). The only modifications I’m making to the patterns is that I’m omitting some of the bobbles. I expect this afghan to be used, and bobbles are not necessarily comfortable for snuggling. Some of the patterns have rather a lot of bobbles.